» What’s Different About Kevin Love? What’s Different About Kevin Love? Kevin Love has had a fantastic season, averaging 26.5 points and 13.6 rebounds per game. But for the month of March alone, over a 16-game span, he averaged 30.7 PPG and 13.9 RPG on 46.4 percent shooting, including 44.9 percent shooting from the 3-point line. He was one of the most efficient players in the NBA in half-court offense, posting a PPP of 0.994 — good enough for the 90th percentile among all NBA players. How has Love been able to make the jump from a good offensive player to a great one? First, I want to look at is his post game. In February, I wrote about this and at the time, he was a decent post player, posting up on 21.9 percent of his possessions with a PPP of 0.881, placing him in the 62nd percentile. Since then, Love has been posting up more often (23.5 percent of his possessions) and his PPP has improved to 0.927 (80th percentile). That’s a pretty significant jump in about six weeks of play. His body control is fantastic. He makes that initial turn while leaning in with his shoulder, forcing his defender to take a step back. Then he has the space to take a jump shot, which he easily knocks down. The key is that turn. This is where his ability to keep the defense off balance is most apparent. You have post defenders trying to play up on Love and take away the jump shot. After a jab step or two, combined with a few pump fakes, Love uses the defense’s aggressiveness against them. In this case, he’s able to get his man to jump, which creates a driving lane allowing him to finish at the rim. Since Love is a power forward, he is defended by opposing team’s bigs, either 4s or 5s. When there is a dribble penetration or pick-and-roll that doesn’t involve Love, his defender usually leaves him to go help — leaving Love wide open. When that happens, Love is available to for a kick-out pass and a catch-and-shoot. If he is in the pick-and-roll as the screener, his defender has to hedge, again leaving him open on the wing. This play starts with Love at the elbow, getting the elbow entry pass. Then the point guard runs right at Love’s defender and sets a rub screen for Love, who dribbles back and pulls up for an open shot behind the 3-point line. 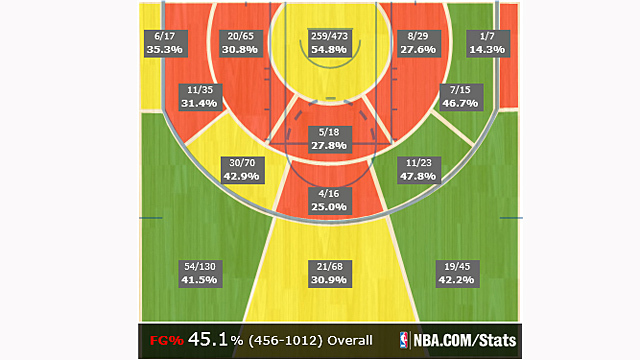 It’s a fun play that can be effective with maybe two power forwards in this league, and Kevin Love is one of them. He’s not the most athletic guy, so you won’t see him finish strong with a tip dunk. You will see him create space to jump up, catch the rebound, and go up with it. For example, in the clip of his putback against the Celtics, he follows Luke Ridnour to the rim. As the shot goes up, Love pins his man, keeps him away from the ball, and draws a foul. Simply put, Kevin Love is giving the Timberwolves more successful possessions. This efficiency on offense has turned him into a MVP candidate, and while he probably won’t win, we definitely have another superstar on our hands. The scary thing for his opponents is that he’s probably going to keep improving.